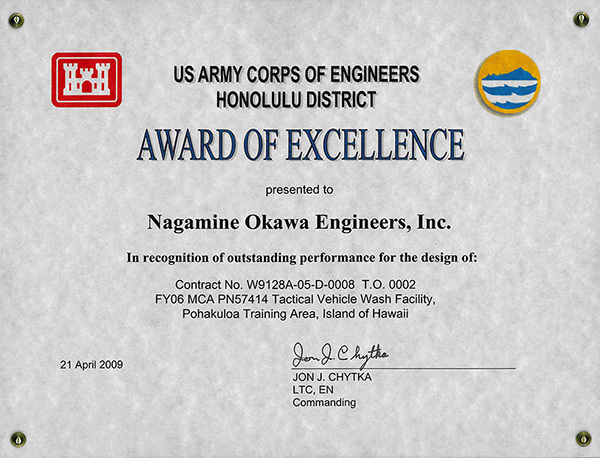 Awards | Nagamine Okawa Engineers Inc.
Award of Excellence from the U.S. Army Corps of Engineers Honolulu District for “outstanding performance” for the Tactical Vehicle Wash Facility Kahuku Training Area, Scholfield Barracks. 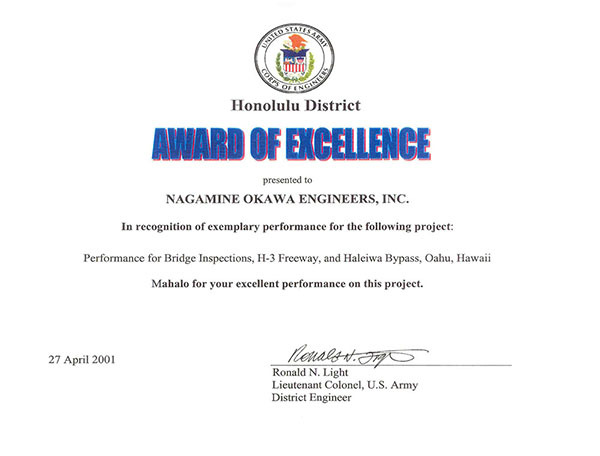 Award of Excellence from the Army Corps of Engineers for "excellent project management" for the H-3 & Haleiwa Bypass Bridge Inspections. Certificate of Appreciation from the US Navy for "exceptional design services provided" for the NOAA Pacific Region Center Ship Operations Facility. American Public Works Association, Hawaii Chapter. Bridge Rehab at Various Locations - Kamehameha Highway Bridge over Anahulu Steam. 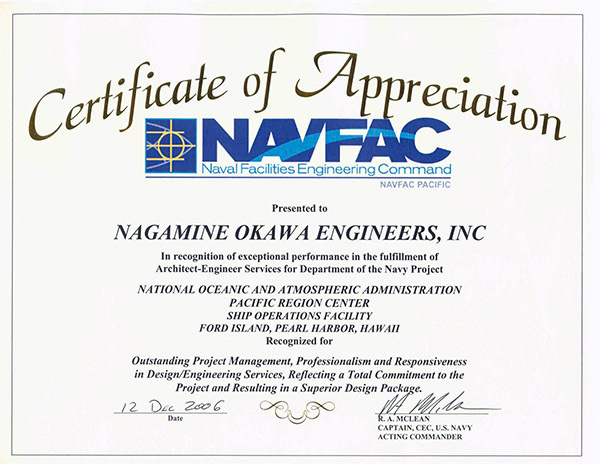 Certificate of Appreciation from the US Navy for "outstanding project management" for the NOAA Pacific Region Center Ship Operations Facility. 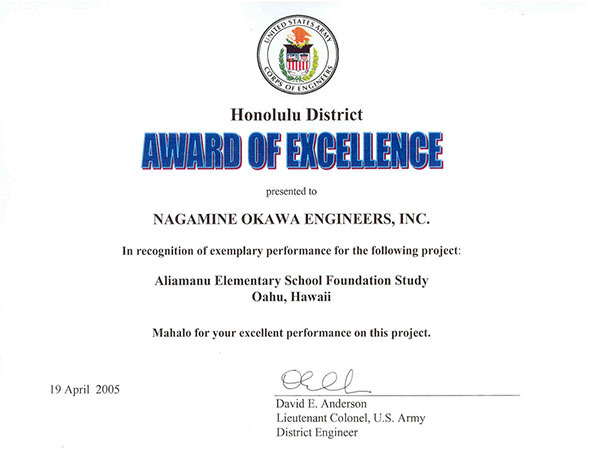 Award of Excellence from the Corps of Engineers for Aliamanu Elementary School Foundation Investigation. "Your staff and their work is exemplary." Nagamine Okawa Engineers Inc. was voted "One of the Best Places to Work in the Nation" in 2007 by Structural Engineer Magazine. Best Small Project Award from the ASCE Hawaii Section OCEA (Outstanding Civil Engineering Achievement) for the Emergency Repairs of Ihiihilauakea Bridge. 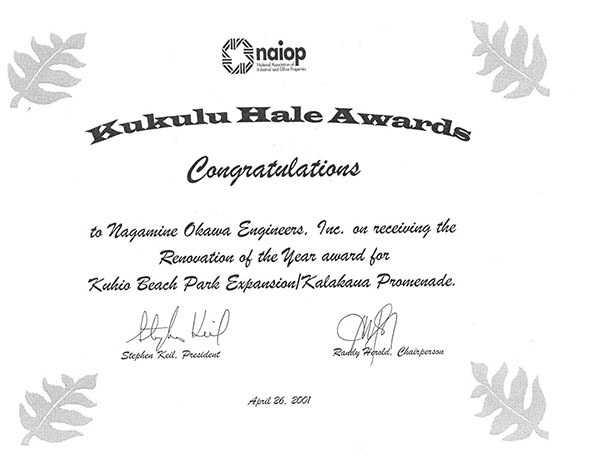 Award of Excellence from the Corps of Engineers "in recognition of outstanding performance for the design" of Kahuku Tactical Vehicle Wash. This project was the design for a new wash facility at the Kahuku Training Area on Oahu. 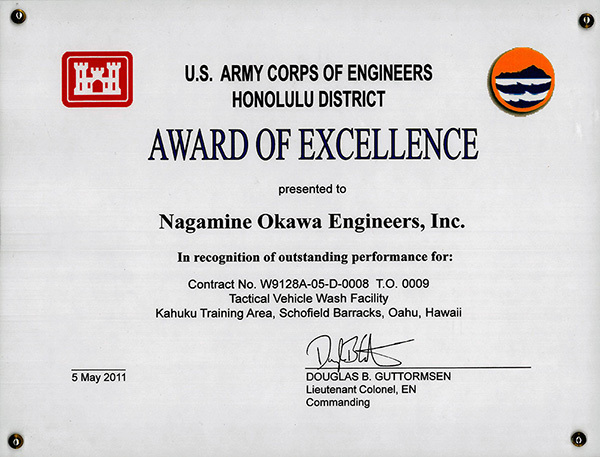 Award of Excellence from the Corps of Engineers "in recognition of outstanding performance for the design" of Pohakuloa Tactical Vehicle Wash. This project was the design for a new wash facility on the Big Island for the Army Stryker Brigade Combat Team vehicle training program. 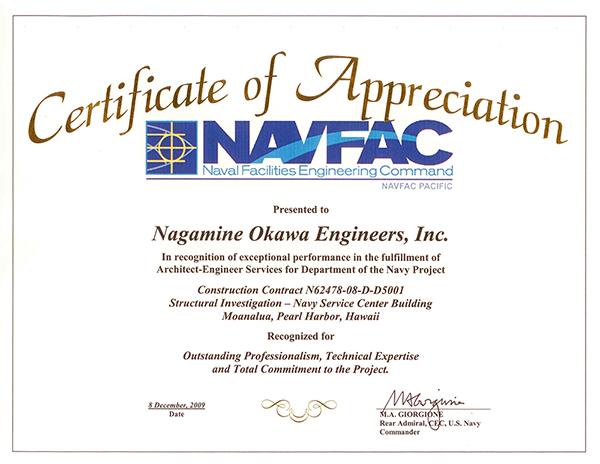 Certificate of Appreciation from the US Navy for the Structural Investigation of the Navy Service Center in Moanalua. 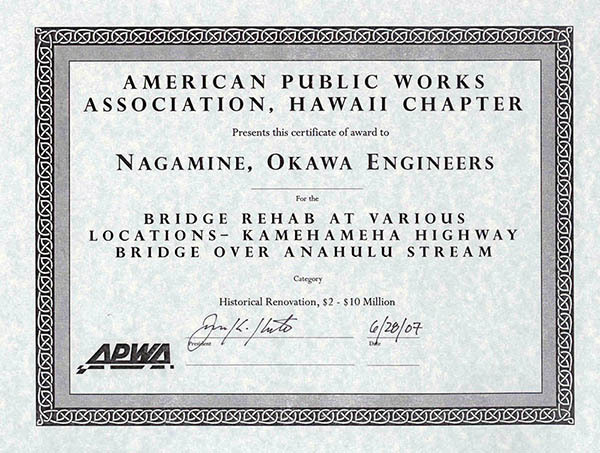 Project of the Year Award from American Public Works Association for the Restoration of Historic Anahulu Bridge in Haleiwa (also known as "Rainbow Bridge"). Building Industry Association of Hawaii Recognition, Women's Health Center at Queen's Medical Center Lobby.